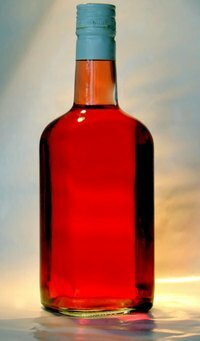 Whether you are making your own liquor or want to customize a purchased liquor bottle, homemade labels provide a special touch. If you can use a computer, you can make your very own liquor bottle labels that can be tailored to a specific occasion like a birthday or anniversary, or just for fun. Liquor bottles sporting customized labels make great holiday gifts. The possibilities are endless for you to get creative with this uncomplicated project. Measure your bottle. Use the measuring tape to determine what size you will need to make your label. Measure the perimeter of the bottle if you are using a completely round bottle. Measure the front panel only if you are using a square or odd-shaped bottle. Design the label with the computer's word processor. Insert text, pictures, clip art or symbols as extra decoration. Use a text box or the measurement tool along the top or bottom of the word processor to scale your label to size. Conduct a test run. Print one copy of your label. Re-measure the label with a measuring tape to ensure you have scaled the label to size. Cut out the label. Position the label on your liquor bottle and affix the label with scotch tape. Print, cut out and attach the labels by applying a thin line of rubber cement on the back side of the label along each label edge. Place one end of the label onto the bottle and press down firmly. Gently pull the opposite end of the label taught. Use your other hand to press the label onto the bottle starting at the attached edge. Smooth the label to get rid of any bubbles that may have formed. Allow the rubber cement to dry for 1 hour. Apply spray lacquer over the label in smooth even strokes. Let it dry for 1 hour. If you have made your own liquor and are presenting it as a gift, include the recipe on the label.